JK & Lucy decided to get in the mood by digging out their frills and flares. Check out the pics of their groovy getup! Joanne Travel and Lucy glam up disco style. Very Charlie's Angels! Aussie Nige, Lucy and Joanne Travel get their disco glad rags on. JK's not joining in the spoilsport! Lucy rocks the gold jumpsuit look! What do you think? The blonde one from ABBA... or Anneka Rice?! We asked for extra extra small for JK but it still looks a bit big?! "You're wearing the outfit JK!" Disco babes Lucy and Joanne Travel strut their funky stuff! Aussie Nige is well-known for his lovely head of hair. He's been up all night perming that afro. Not sure about the shirt though Nige! Spaceman, surgeon or radio presenter? JK gets his kit on. Underneath that cool exterior, JK's loving his disco outfit... Honest! Producer Aussie Nige, JK, Lucy and Joanne Travel in the funky surroundings of the Heart Breakfast studio. 16. 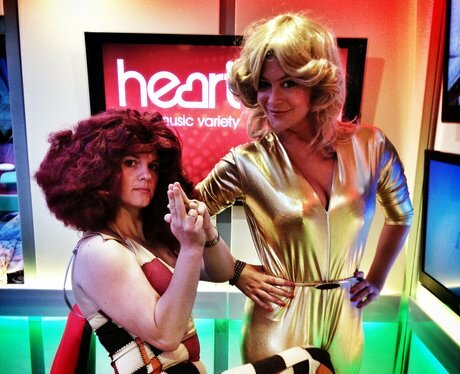 The Heart Breakfast Team - 70s Style! Is it the return of ABBA? Or the Heart Breakfast team? JK and Lucy do their best Bee Gees impression!